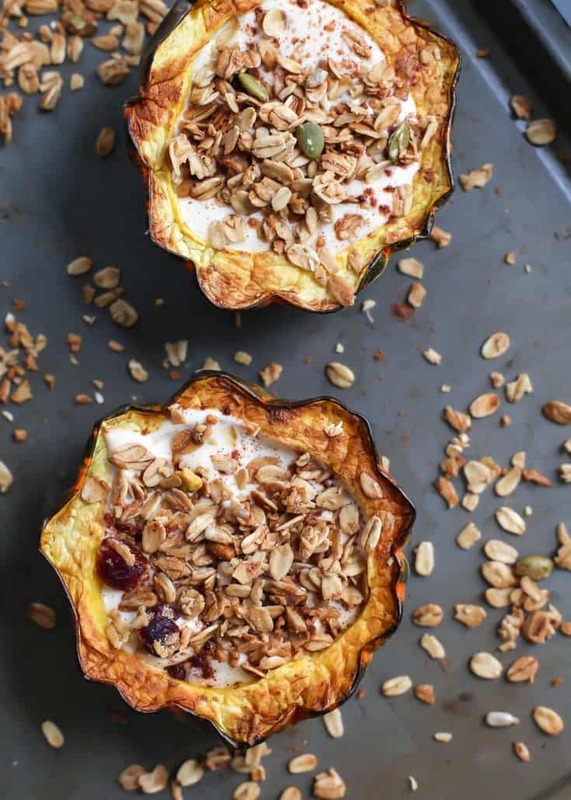 Change up your breakfast routine with an Acorn Squash Breakfast Bowl. 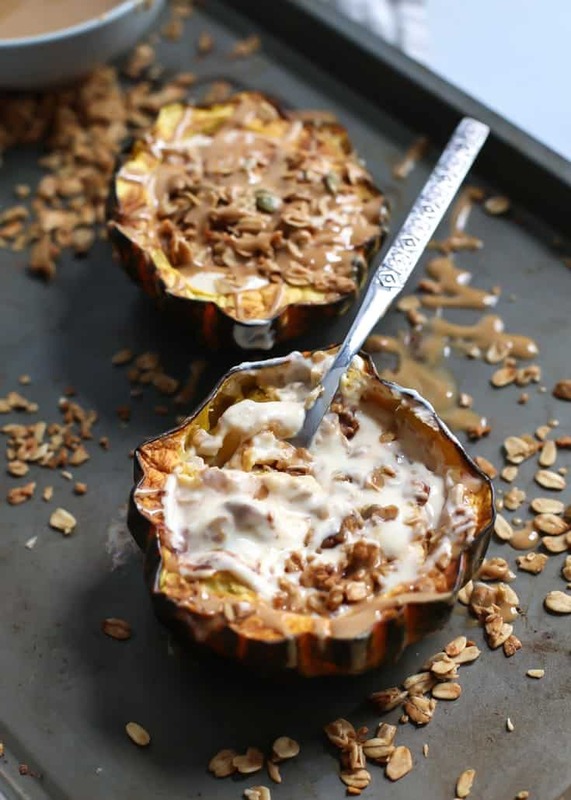 By prepping the acorn squash ahead of time, you have a quick and simple healthy breakfast. Gluten-free, vegan-friendly and you can sub a couple of ingredients to make paleo too. I’m having one of those days where I feel like I would be better off getting out of the house and working in a coffee shop for a few hours. I can’t seem to stay in one place and actually work. I’ve moved from the office desktop, to the office couch with my laptop, to my bed with my laptop… and then back to my office desktop. Lordy what is wrong with me? MUST. STAY. FOCUSED. Except the last time I worked in a coffee shop I sat next to two people having a long conversation, one being one of the loudest talkers I have ever heard in my life. No headphones could drown out that voice. I mean I understand it is a public place so I am not expecting that I won’t hear others’ conversations… but you’d think she would understand that maybe she could keep her voice down just a tad. I got to hear everyytthhiinngggg. For like, a good hour. And the coffee shop was already pretty full so me getting up to move seats was not an option. Do I sound like an old lady or what? You know what is surprisingly good? 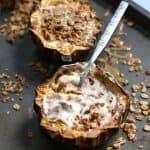 Roasted acorn squash + yogurt + granola + nut butter. Call me crazy but this breakfast bowl is legit. Scoop out seeds and lightly oil inside of squash. Place face down on a lined baking sheet and bake for about 30 minutes, or until soft. 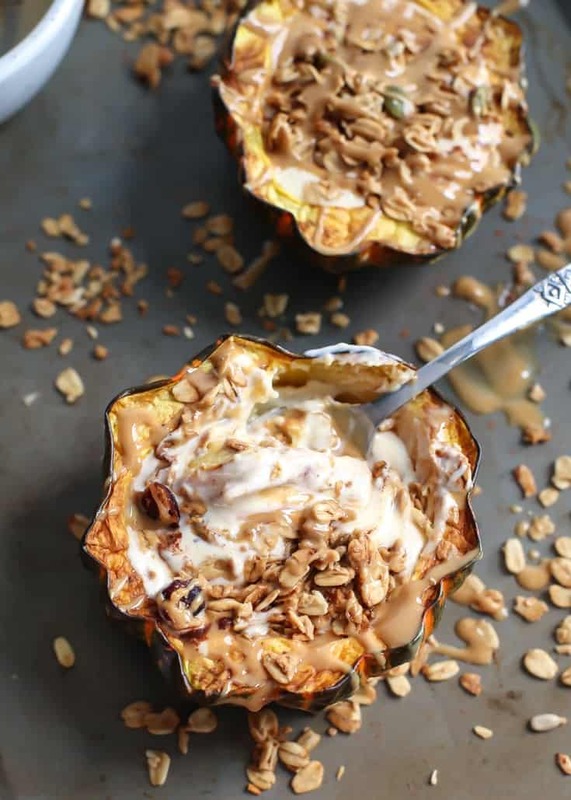 At this point you can either fill the squash with yogurt, granola and nut butter, enjoying right away. OR you can refrigerate the squash and prep the rest of the ingredients to bring with you to the office, or wherever it may be that you need to go. Simple and healthy breakfast bowl FTW! I hope you give this one a try. extra optional toppings: chia seeds, nuts, hemp hearts, fruit, etc. Prepare squash: Preheat oven to 375ºF. Spray/grease or line medium baking sheet with parchment paper. Cut open squash down the middle. Scoop out seeds (save for roasting later or discard). Oil inside of squash, dust with cinnamon if using and place face down on baking sheet. 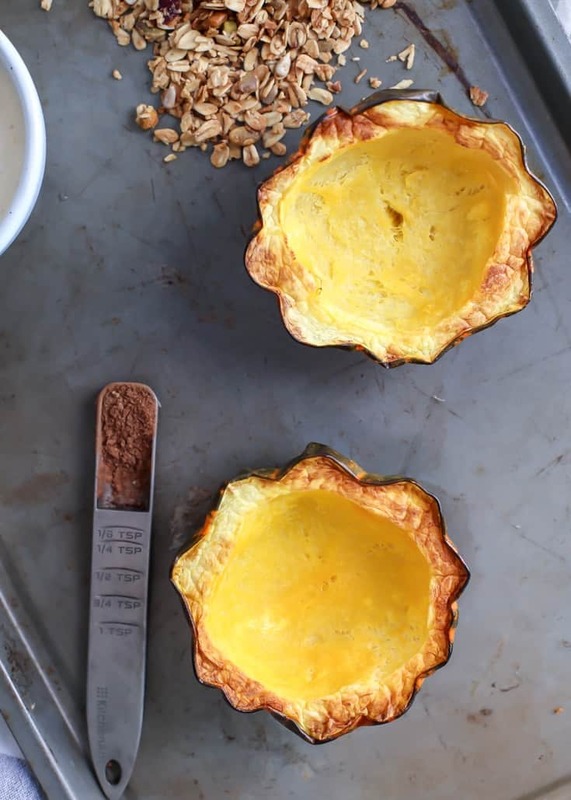 Bake squash for 30-45 minutes, or until soft. Time in oven will depend on size of squash. Mine was just over one pound. 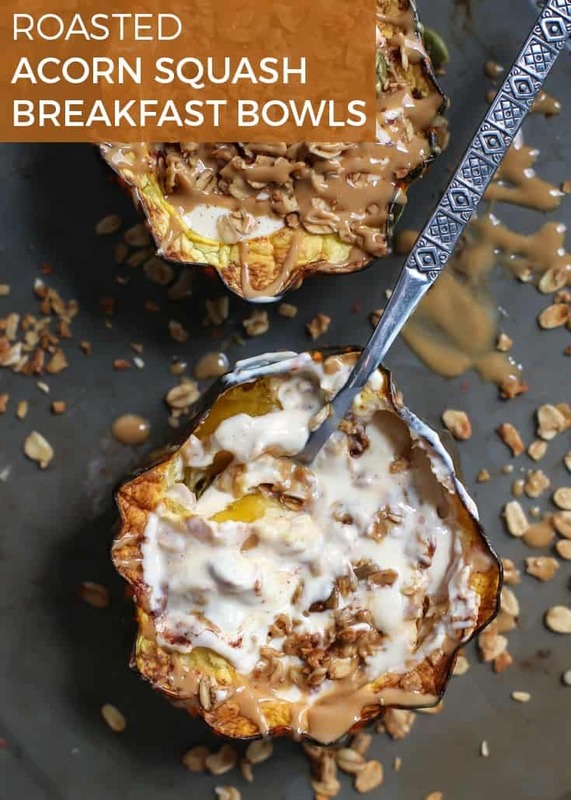 Assemble breakfast bowls: Evenly divide yogurt into each squash bowls, topping with yogurt, granola, nut butter and any additional toppings you’d like. Prep time refers to the time it takes to make squash in oven. If using large squash, adjust servings and ingredients for filling accordingly. 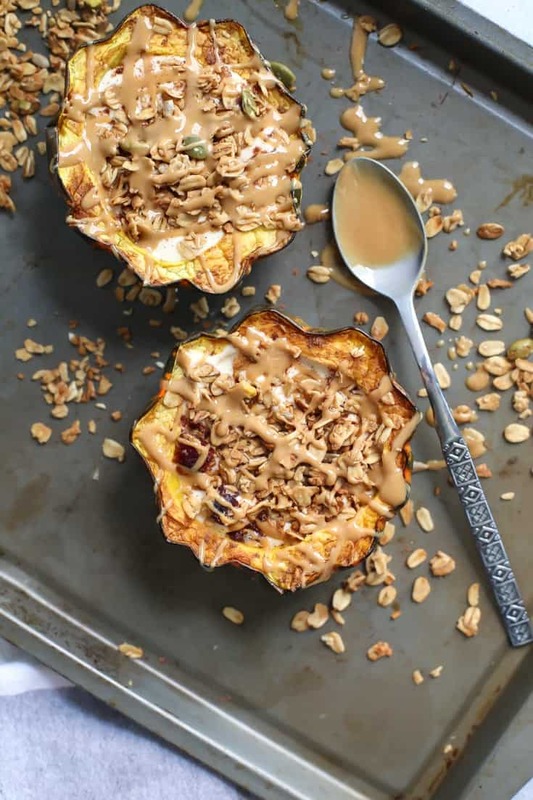 This recipe can be used for meal prep – store baked squash covered in container in fridge up to 1 week. This post contains some affiliate links. Should you choose to purchase through said links, I will receive a small commission. Thank you for your support in helping keep Fit Mitten Kitchen up and running.